The DMSR and the military-focused DMSR M2 are the highest performers in Xplore’s new XC6 line, and both have eye-popping hardware and durability features. A more basic XC6 model starts at US$3,299, but the DMSR tablets, priced at $5,299 and $5,599, have better components and screens. The DMSR models both have handles and are encased in tough protective covers. They can be dropped more than 2 meters onto a plywood floor and 1.2 meters onto concrete, and can operate in temperatures between -30 and 140 degrees Fahrenheit (-34 to 60 degrees Celsius). They’ve been tested to the U.S. military’s tough MIL-STD-810G standard for extreme conditions. The tablets run Windows and come with Intel’s latest Core i5 or i7 Haswell processors. Solid-state drive options extend to 480GB. Few other tablets offer more than 128GB, with an exception being Razer’s $999 Edge Pro gaming tablet, which has a 256GB SSD. The DMSR and DMSR M2 have many common features, including 10.4-inch rainproof screens. They display images at 1024 x 768 resolution. That’s less than some cheaper Windows tablets, but Xplore claims to offer excellent LCD visibility in sunlight thanks to a display luminescence of 1,300 NITS. Other features include Intel’s GT2-4400 integrated graphics, two USB 3.0 ports, and RJ-45 ethernet and microSD slots. Wireless options include 802.11ac Wi-Fi and a slot for connectivity to AT&T’s LTE network. Display connectivity options include HDMI and VGA ports. The company’s tablets were used for chemical and radiation detection during the Fukushima nuclear disaster in 2011, and are commercially used by AT&T and other companies in the field. The durability keeps maintenance costs down, and the company provides a three-year warranty. 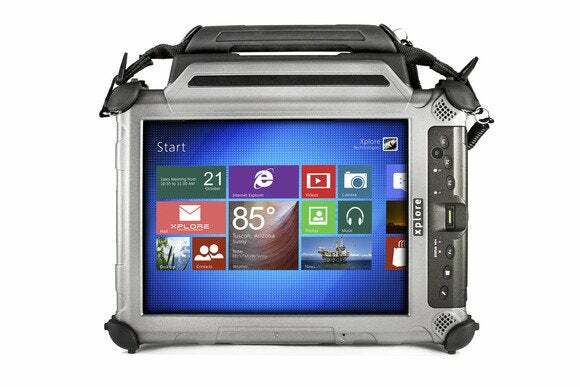 The military won’t use standard Windows tablets in the field and Xplore has to design its own motherboards. The redesign involved shrinking a motherboard to tablet size and using industrial parts that can withstand high temperatures and vibration, Holleran said. The Windows 8.1 option isn’t popular with customers, many of whom downgrade. “Most buy Windows 8.1, but they ask us to ship it with a Windows 7 BIOS,” Holleran said. The cheaper XC6 DML model, starting at $3,299, and the XC6 DM, starting at $3,999, also have rugged features but use an Intel Celeron 2980U processor and come with less storage. They also don’t offer the same visibility in sunlight as the DMSR tablets.